Cartoonist Sudhir Tailang who was suffering from a brain tumour passed away on Saturday at a private city hospital. He was 55 and had been under treatment for over two years. Born in Bikaner, Tailang came out with his first cartoon in 1970. 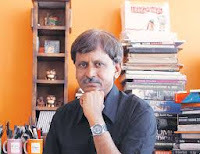 He started his career with the Illustrated Weekly of India in Mumbai, in 1982. He was awarded the Padma Shri in 2004 for his contribution to the art of cartooning. PM Modi has condoled the death of the cartoonist and in a tweet he said "Sudhir Tailang's demise is untimely & unfortunate. His brush brought smiles on many faces. Condolences to his family. RIP."